The SK-WP Series represents one of A&D most rugged and durable lines of scales. These IP-65 rated waterproof and dustproof units feature a stainless steel housing, large (9" x 7 1/2"), removable stainless steel weighing pan, and an easy to read 1" (25 mm) high LCD. 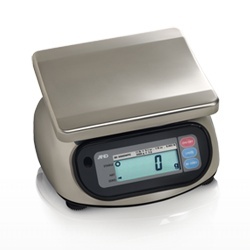 A&D SK-WP Counter Top Bench Scale features Large & clear LCD display, Large square weighing pan--232mm(W)x192mm(D), Rugged construction, Stability Indicator, Separate Keys for Power and Re-Zero. NTEP legal for trade models available.